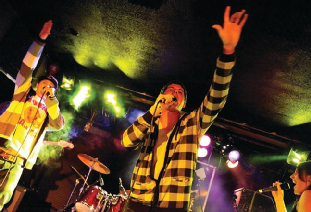 It’s Homecoming weekend, and a crowd of former and current students has trekked downtown to a club on Cayuga Inlet where a band called Pants Velour is performing its catchy brand of hip-hop. Their time is up, but just before they’re hustled offstage they insist on playing one more song. “We’ve got to do this one,” says front-man Josh Raff ’07, as the band launches into “Da Alma Mada,” their hip-hop take on a classic.